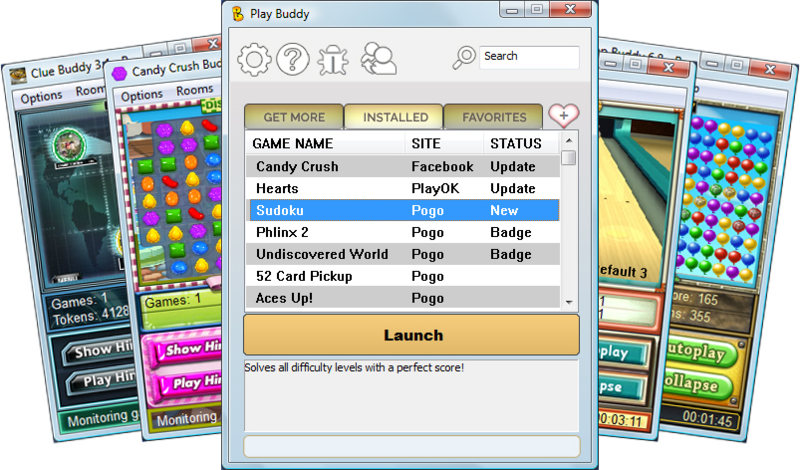 Play Buddy - Auto Helpers for Pogo badge winners and Facebook & King players! 150+ Buddies, 4 Game Sites. I'm a long time pogo customer and I've ranked out in many pogo games that I have no idea even how to play. I found Play Buddy about 3 years ago and have been nothing but impressed with their products, and as importantly, their customer service. I could go on and on about why I'm a Play Buddy customer, but I've gotta go earn another badge. Thank You for making that possible again Play Buddy. I'm trying to learn how to play chess and this program helps so much. I have recommended it to many of my friends who have trouble learning the game. Thanks. If you have any doubts about trying Play Buddy forget them and try them. They are fantastic. Worth every penny. Your site is a life saver for a person with Essential Tremors (similar to Parkinson's) that sometimes make it hard or impossible to get some badges - especially the timed badges. Thank you! After being a monthly member for a few months now, this is highly worth the money. Best autos out there. There is no comparison to your buddies. Thank you. Upon much thought and help from the Play Buddy Support Team I have decided to purchase the monthly plan for Play Buddy. For the past few days I've played using the 7 day FREE Trial of my favorite games and I understand now how they are played. Boy!!! I'm sure going to have a lot of Play Buddy Icons on my desktop...LOL I really like the feature of the "HINT" for the word games. It is very helpful. Sounds like Play Buddy is now going to be my "BEST BUDDY". I want to thank you for all the friendly e-mail contacts, support of the staff for all the help you have given me to understand Play Buddy. I will highly recommend you to others. I really love Play Buddy it has helped me win so many games that was so hard to win. The website is so easy to understand and the tech support is great. I suggest to any players try the free download and I promise you will love it and the price is right. Thank you Play Buddy.